What to do with tomatoes. I have two gardens this year, the usual one in the yard as well as an ‘off-site’ one in the community gardens. Both have tanked this year. Squirrels, rabbits, groundhogs and deer have feasted mightily. The deer took out both the taller netting we put up to stop them as well as kicking down the wooden fence on one side of the community garden. It’s become a free range buffet to those beasts. The on site garden hasn’t fared much better. Two gardens and all I have to show for it is a bowl full of cherry tomatoes and a handful of peppers. Even basil, supposedly so easy to grow anyone can do it, has been devastated by bugs. The Malabar Spinach I planted has failed to take off because it hasn’t been hot enough. (It did not get out of the 80’s once here the entire month of August.) Major garden fail on every level. I’m considering not having a garden next year, because the amount of work, not to mention money I’ve dumped into harvesting practically nothing is beyond frustrating. Thankfully, there are a number of farmers at the market this season selling boxes of canning tomatoes for a virtual song. I generally buy a few of these beauties every year to put up, but this year, with a drought of my own homegrown ‘maters, I’ve been buying them to just have. You can’t beat the price, which starts at about $12 for 20 pounds and goes up from there. Some farms throw heirlooms in the mix, some offer romas and other paste tomatoes. So what exactly are ‘canning tomatoes’? Generally these boxes are full of tomatoes that are smaller, have some blemishes or are on the verge of being over ripe. When I get the box home, I open them up and sort through the tomatoes as soon as possible. (If I’m canning the entire box, I might skip this step). In the past, I’ve bought my canning tomatoes almost exclusively from Shady Lane Farm. This year however, I thought I’d try a box from Crossing Brook Farm – otherwise known as Farmer Brown’s farm (where I often buy my corn). 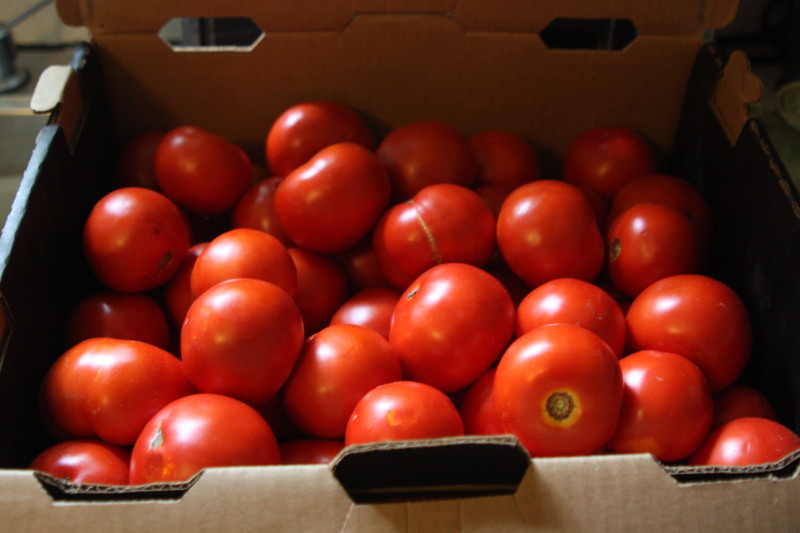 The first box of tomatoes I got was so beautiful – one blemish in the entire box – that I keep going back for more. 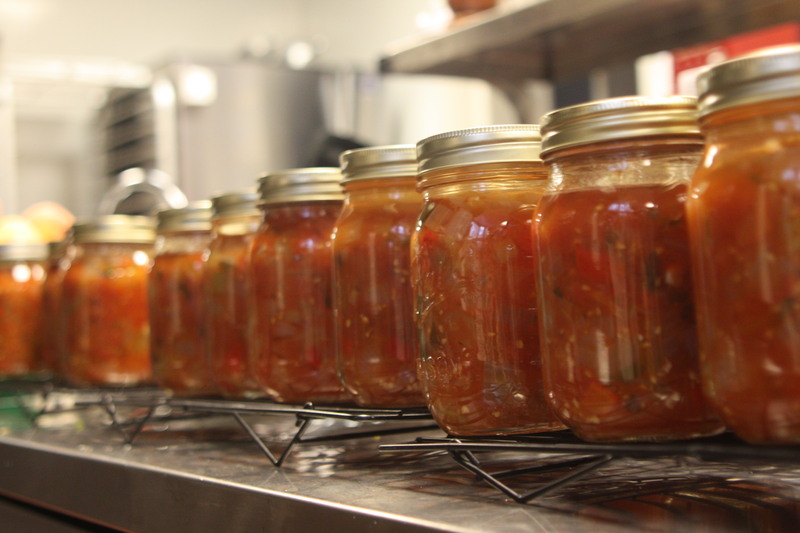 (Not that I’ve abandoned Shady Lane – they’ve been supplying my weekly canning classes.) I’ve bought so many boxes from Farmer Brown this season that he actually asked me the other day what I’m doing with all those tomatoes. Photo credit to my neighbor Christin, who helped me peel, chop & pack a box of tomatoes in less than an hour flat AND left my kitchen cleaner than she found it. I may never can without her again. The first answer is canning. 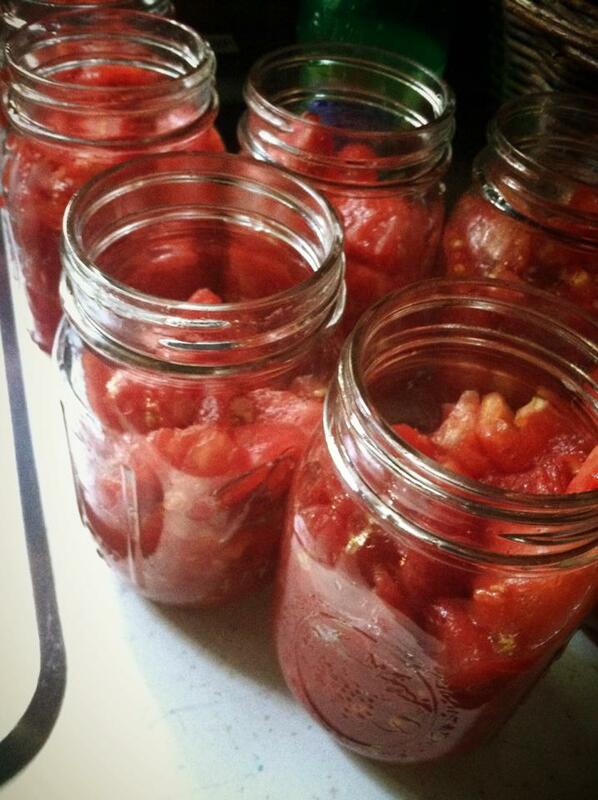 I like to have about 4 cases or so of pint jars filled with plain tomatoes on my shelves in the basement. Last year I experimented with making marinara, which was nice to have on hand, so I will probably make some more this year. I worked at the restaurant this weekend, which typically means I leave dinner or at least a plan for dinner, for the family before I go in for my shift. I tried out Marisa’s pizza sauce from her latest cookbook, Preserving by the Pint, leaving it cooling on the counter in jars as I headed out. I figured before I put some on the shelves in the basement, we’d give it a trial run. It was met with great fanfare, so much so that they ate an entire pint of it at once. They declared it one of the ‘best pizzas ever’. I also need to make more of this salsa. Generally, I am not a fan of canned salsa – in order to be acidic enough to can, vinegar must be added to salsa and I find it I don’t care for the taste. We made this salsa in one of my canning classes and it was fantastic. It has an incredibly fresh taste that most jarred salsas don’t. I brought home two jars, one of which Edie & her friend Clare ate for lunch one rainy day while watching TV. Clearly, more is needed. And then we come to the variety of ways in which we eat them at almost every meal. There were enchiladas this past weekend, a pot of gumbo was made, of course tomato sandwiches and my new favorite, Jennifer’s Bruschetta. You should make that one for dinner tonight. Because now that it’s September, it’s warming up out there, with highs in the 90’s today. You don’t want to be slaving over a hot stove, just whip up a batch of this and call it a day. While I plan to check into the marinara sauce you posted, I thought I would pass along a little garden knowledge for next year. For many years, my father grew a garden at my mother’s farm outside of Lafayette, AL (in the country). He had the same problems you described with warm blooded critters. While the smaller ones were deterred with chicken wire and low-light applications of small caliber cartridges, my father came up with a unique barrier for the deer. In addition to using a 5 ft garden style wire perimeter fence, he would also install one or two strands of high visibility yellow nylon rope a foot or two apart (respectively) above the fence. This gave the appearance of the fence being much taller, which worked like a charm. Good luck on your garden next year. Like you, all we got were a handful of tomatoes, but some of the best hot peppers I have ever grown (Hinkelhatz). At the community garden, we had the bottom of the fence double wrapped in chicken wire and rabbit fencing. Over the top of the wooden fence, we had netting, hung intermittently with fabric strips, that went up 12′ high. In addition to the flooding, the poor soil, I’m not sure I’m going to do that venture again. As for our garden plot here at the house, I might do with the tomatoes what we do with the blueberries – cover them in bird netting. I just today got some large ziplock bags and stuck some whole tomatoes in my freezer. We’ve actually been eating a lot of them –lunch today was two cut-up tomatoes with salt and chunks of fresh mozzarella –yummy, and I’m going to so miss that flavor once the season is over. I forgot to list freezing them whole as something else to do with them – not at that point in dealing with them yet I suppose. I love making tomato soup with my frozen tomatoes. I think that’s the best way to capture that summer taste, especially when it’s cold and wet out there. I love me some ‘maters! I must check out the recipes especially the bruschetta! That bruschetta is divine. We’ve had it four times in two weeks and no one has complained yet that we’re eating it too much. I have a long running thing where we only eat tomatoes that I know who grew them, so I spend a good bit of time putting up tomatoes every summer. I still need to put up about another bushel and then we’ll be set.